Many easy readers are also available as an audio book, and teachers will be interested in the practical teacher's guides! Spanish easy reader for beginners. Secret agents, hidden symbols and lots of humor and action in the historical setting of France and Spain in between world wars. A good read! Spanish novel for beginners. An interactive novel: at the end of each page, you decide how the story continues! Fun Spanish easy reader for elementary/primary students. Berto has a lot of good ideas. He can think of many fun and exciting things to do rather than going to school. Order now! Fun Spanish easy reader for beginners. Berto doesn't want to clean his room. He prefers to hang out with his friends, play with the dogs and become famous on YouTube! Spanish easy reader for advanced students. Bianca's father is bull fighter. The real danger, however, lies outside the arena. Will Bianca be able to save her father? 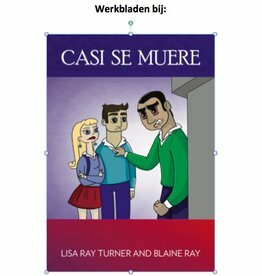 Spanish audio book for advanced students. Bianca's father is bull fighter. The real danger, however, lies outside the arena. Will Bianca be able to save her father? Practical, extensive teacher's guide for the thrilling Spanish novel (level 3/ B1). full of cultural backgrounds and fun activities. Order now! Fun Spanish easy reader for beginners. Rather than get caught in the act of disobeying his mother, Brandon decides to lie to her. This causes unforseen problems! Fun Spanish audio book for beginners, ideal for elementary/primary students. Brandon wants a dog. He will do anything to get one. Anything...? This practical teacher's guide on CD helps you explore the cultural and linguistic resources for this Spanish novel. Lots of interactive, fun activities! Fun Spanish easy reader for beginners. It takes Brandon Brown less than a day to find trouble while on vacation. Past and present tense under one cover. Order online! Engaging Spanish easy reader for beginners, especially for elementary/primary students. About a stubborn little boy who does not want to move to Mexico with his mother. Spanish novel for advanced students. Based on true events, this novel chips away at political propaganda with a gripping tale of heroism, espionage, economic collapse, and compassion. Single sheet reproducibles with sub plans or homework activities for your students. Included are chapter-by-chapter questions, fill-in-the-blanks, crossword puzzles, word searches etc. Spanish easy reader for beginners. Daniel wants to be a detective, and when his concert ticket disappears, he decides to investigate it in a very professional way. Spanish novel for absolute beginners. Fun, simplified version of the famous story. Did you know that reading Spanish could be this much fun? Order online now! Beautiful Spanish novel for beginners, about a magic bracelet, a talking snake, courage and family ties. Legend from the Mexican city of Guanajuato about a romantic, but forbidden love. 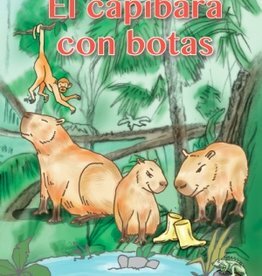 Teacher's guide to the reader 'El capibara con botas'. A wealth of ideas, materials and information. With lesson plans.